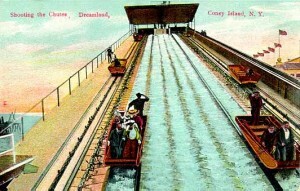 Michael Immerso, in his book “Coney Island: the People’s Playground,” describes the epicurean delights found at the year-round New York amusement park “as combustible as its fastest rides.” It was Coney Island where Americans—native born or immigrant—tasted the literal melting pot that is American cuisine. From saltwater taffy to clams to hot dogs to pizza, food was an indelible part of the Coney Island experience. Coney Island was a vacant, five-mile beach made of sand and scrub from its discovery in the early 17th century until the mid-19th century, during which sweltering New Yorkers escaped the crowded, hot summers for this little piece of coastline. Their migration was aided by the introduction of railroads and steamship lines, which sliced the travel time from the greater New York area practically in half. Developers were quick to capitalize on the hordes of families traveling to Coney Island by erecting dazzling and gaudy hotels with the latest amenities, offering piped-in water, gourmet dinners, security, and lots and lots of musical entertainment. The amusement park moved into high gear during the Gilded Age, where swimming and sunbathing became popular pastimes, and the world’s first roller coasters and amusement park rides made their debut. 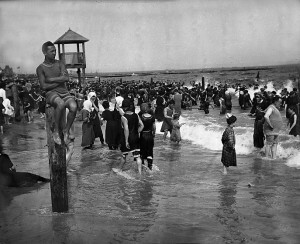 Despite a brief period where Coney Island’s reputation was sullied by its links with crime and prostitution, the little islet was the place to go for relatively good, clean family fun for working- and middle-class Americans, who obviously could not afford vacations at luxurious and expensive resorts like Newport, Cape May, or Bar Harbor. By the turn of the century, even New York’s wealthiest citizens found Coney Island irresistible, and many exclusive clubs, like the University Club, the Union League Club, the New York Club and the Coney Island Jockey Club used the luxury hotels as their summer headquarters. The plethora and variety of food available was as much a part of the “Coney Island experience” as betting at the races or riding a roller coaster. There were hundreds food and drink stands selling everything from frozen custard, corned beef and cabbage, shish kebabs, bagels and lox, hot clams, waffles, to ears of corn roasted and buttered for ten cents. Sit-down restaurants were just as plentiful and varied: Romanian tearooms, oyster bars, chop suey joints, hamburger stands, and of course, hot dogs. The king food of Coney Island was the hot dog. The etymology of the hot dog is an amusing story. The phrase first appeared in print in 1896, where it was an exclamation for something great, and was in use from about 1900 when referring to the frankfurter and bun. In slang, it was also called a Coney Island red hot, or a New York tube steak, but refined periodicals and people called it a frankfurter or wienerwurst, as the word “hot dog” had negative connotations stemming from rumors of Germany butchers stuffing dogs, cats, horses, and even rats into their sausage meat. However, the hot dog was very much an American invention, deriving from the concession stand of one Charles Feltman. Feltman owned a somewhat successful pie-cart, from which he delivered fresh-baked pies to hotels and saloons. When his customers requested hot sandwiches to serve their patrons, Feltman cast about for a solution to his problem: his cart hadn’t much space and he didn’t have time to fix a number of different sandwiches. His mind lit upon the idea of a hot sausage in a roll. A colleague fixed the cart with new devices in which Feltman could keep the rolls toasted as well as boil the sausages, et voila, the hot dog. 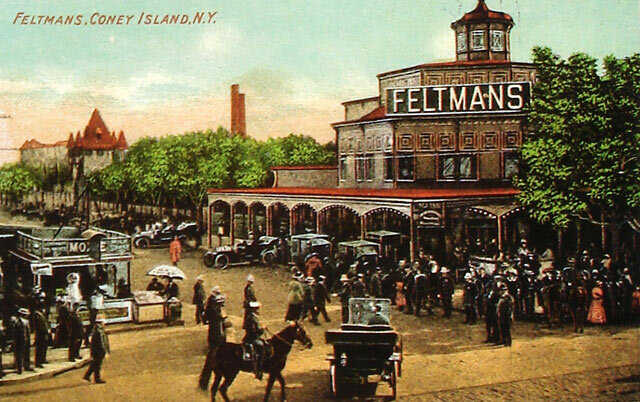 By the 1880s, Feltman had expanded his business considerably from carts to sit-down restaurants, and served approximately 200,000 patrons during that decade, 370,000 a year during the 1890’s, 900,000 during the 1900s, and more than 2,00,000 during the 1910s. Feltman’s success eventually got the best of him by the mid-1910s when a former employee set up a hot dog stand to sell his hot dogs for five cents as opposed to Feltman’s ten cents. This employee, Nathan Handwerker kept his business in its roots by opening new hot dog stands rather than restaurants when his hot dogs edged out his former boss’s chain of restaurants. Other foods with a claim to Coney Island were ice cream in waffle cones and taffy. The former was said to be invented by a peddler known as “John the Greek,” though others such as Ernest Hamwi, Italo Marchiony, David Avayou, and Abe Doumar can each lay claim to inventing the waffle cone. Saltwater taffy had its roots in Atlantic City, where it was invented in 1883 by a Boardwalk candy seller named David Bradley, but it was popularized by Joseph Fralinger, who owned a taffy stand and became the first to sell saltwater taffy in one pound souvenir boxes. The candy made its way to Coney Island, and to other sea-side resorts along America’s East and West coasts, by enterprising entrepreneurs, who were likely to introduce a new or revised staple and stake their claim as its inventor. Nonetheless, this cornucopia of food reflected both the adventurous palate of Americans, and their ready acceptance and adoption of foods brought to the emerging nation by its immigrants.